Yamaha's Digital Sound Projectors have long impressed us. Yamaha's Digital Sound Projectors have long impressed us. 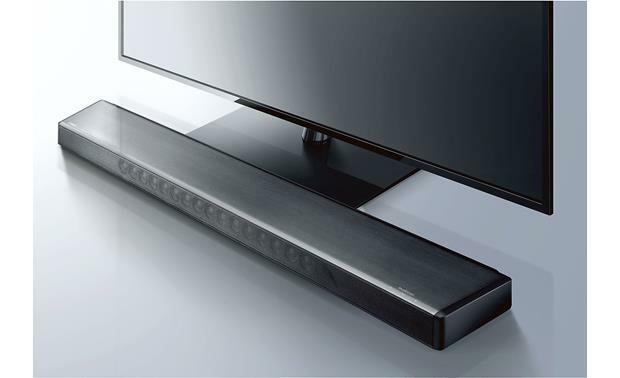 Their clever beam drivers bounce sound off the walls in your TV room to make it seem like there are speakers where there are not. 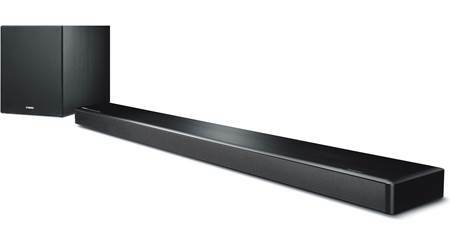 And the YSP-2700 sound bar offers Yamaha's best simulated 7.1 surround sound yet. This compact, easy-to-setup bar and subwoofer system pulls you deeper into your shows and movies with enveloping soundtracks and effects. The Yamaha YSP-2700 uses 16 beam drivers to project room-filling surround sound effects. As for music? 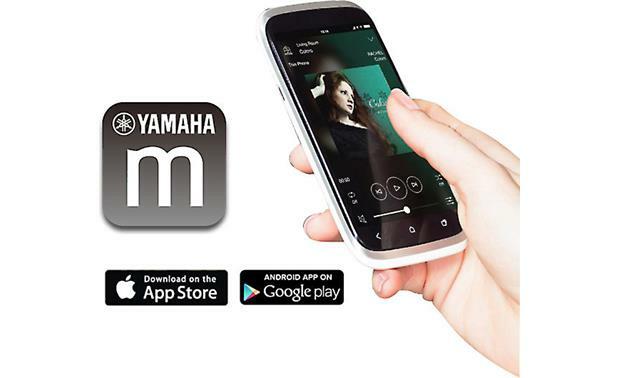 Yamaha's cool and intuitive MusicCast streaming technology is built-in. This app-based wireles system puts your entire library of digital tunes at your fingertips and offers flexible options for expanding into multiple rooms. MusicCast lets you play your music library wirelessly through the YSP-2700's powerful drivers, or through MusicCast speakers in other rooms. It all starts with the free app, available for Apple® and Android™. It's my favorite multi-room app at the moment, thanks to its intuitive layout and “current” feel. User-friendly graphics make it easy to select rooms, pick music services, and adjust volume. You can even substitute your own images to make the menu more personal. Built-in two-way Bluetooth lets you stream audio from any app onyour phone through the MusicCast system. 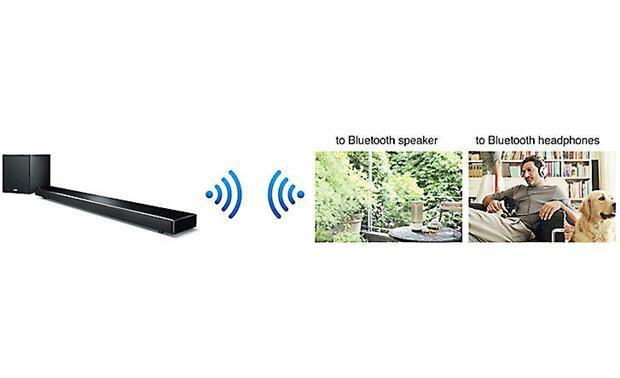 You can also send audio from the sound bar to other Bluetooth-enabled audio players, like wireless headphones — convenient for late night movies or football games. Sound is Outstanding. 5 Stars all the way! Does HDMI ARC allow you to control YSP-2700 volume with TV remote? Digital Sound Projector: While typical sound bars offer only "virtual surround", the YSP-2700 is equipped with a 16-speaker array powered by sixteen 2 watt digital amplifiers and Yamaha's exclusive Digital Sound Projector technology to deliver a truer 7.1-channel surround sound experience. The result is an expansive and immersive listening experience that brings your favorite music soundtracks, TV shows, and movies to life. 16 Speaker Array: The YSP-2700 employs a high-performance processor to precisely control the timing of 16 digital amplifiers and 16 speakers, creating controlled "beams" of sound. The sound beams are then aimed, either directly or by reflection off your walls, to arrive at your ears from discrete, channel-appropriate directions. Rigid Aluminum Enclosure: The digital sound projector's body is made from aluminum with outstanding rigidity for best sound performance, while the aluminum top-panel features a hairline finish to give it an elegant appearance. 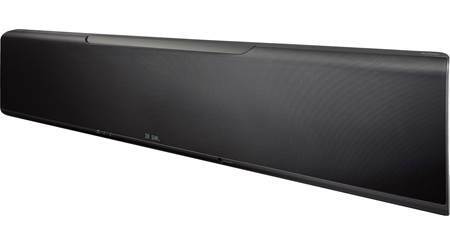 Wireless Powered Sub: The YSP-2700 system includes a wireless powered subwoofer to handle your movie's LFE channel and your music's deep, low bass notes. The wireless powered sub features a front-firing 5.25" woofer in a bass-reflex cabinet with a front-firing power and is powered by a built-in 75W RMS (130W peak) amplifier. The wireless subwoofer can be placed up to 50' away from the digital sound projector (still requires AC power outlet). The digital sound projector also features a mono-RCA sub output if you choose to connect the included powered subwoofer with an optional subwoofer cable (sold separately), instead of wirelessly. 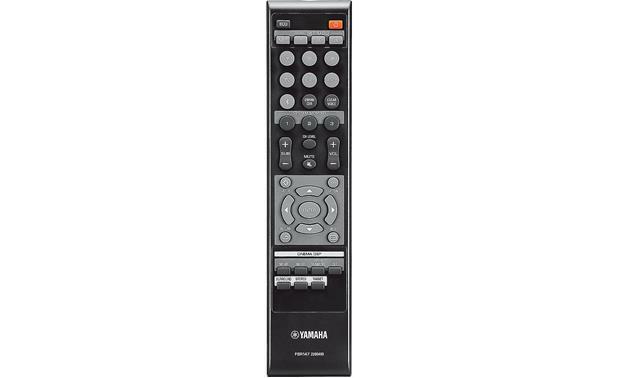 IntelliBeam Auto Calibration: The exclusive Yamaha IntelliBeam auto calibration system makes setting up your sound bar easy. Using the supplied microphone to measure room acoustics, IntelliBeam automatically sets the best beam angles while optimizing the level and frequency response of each beam. This makes initial setup both extremely simple and acoustically perfect. You can save 3 auto calibration presets for easy recall. Once the Auto Setup is complete, you can fine-tune the Beam Settings. Horizontal Angle: Set the horizontal angle of the listening position relative to the center of the speaker, this adjusts the angle of each beam to best match your listening position. Beam Travel Length: Total travel distance from speaker to reflecting surface to ear for each beam. Focal Length: Distance from the speaker to the focal point of each beam (where the speaker would be if you had five separate speakers). Image Location: This feature adjusts the direction from which the front left and right speakers are heard if they sound unnatural. Channel Out: Specifies the type of output (Beam, Stereo, Mix) from each of digital sound projector's channels. Beam Modes: The YSP-2700 digital sound projector lets you choose from 5 different Beam modes - 5ch, 7ch, My Surround, Target Playback, or Stereo. 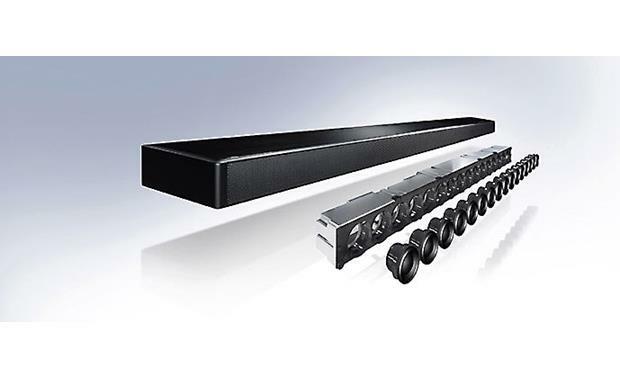 7Ch Surround: Front Left/Right, Center, Surround Left/Right, & Surround Back Left/Right beams output audio for 7.1ch surround sound that is truly immersive and enveloping. 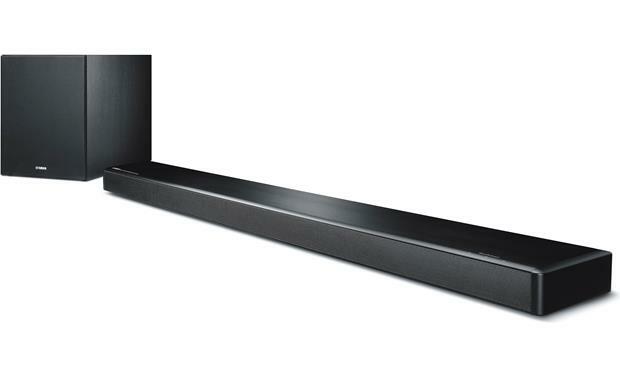 5ch Surround: Front Left/Right, Center, and Surround Left/Right beams output audio for 5.1ch surround sound that feels like you have speakers all around you. My Surround: Designed for small listening areas or when surround sound effects are unsubstantial due to the listening room conditions. Target Playback: Target playback mode outputs sound beams from a single channel for optimal listening from a specific seated position. Stereo: 2-channel stereo playback without surround processing. 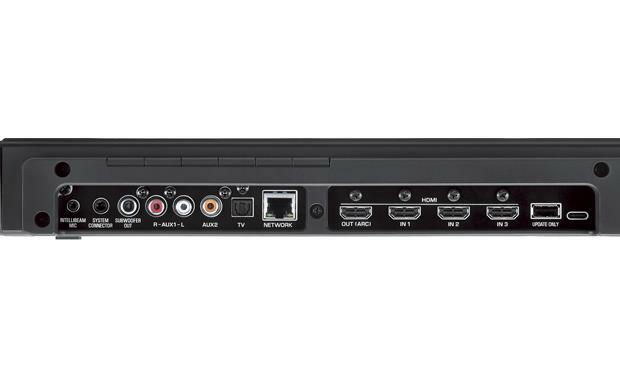 HD Audio Decoding: The YSP-2700 decodes HD Audio signals to ensure that you hear the best possible sound from Blu-ray Disc players, as well as from all other digital audio sources. It offers HDMI (3 in/1 out), digital (1 optical in/1 coaxial in), and analog (stereo RCA) connectivity. The YSP-2700 supports the following digital audio formats. Because with many TVs, the ARC-enabled HDMI input will only pass 2ch PCM from devices connected to the TV via HDMI or analog, we recommend that you connect your Blu-ray player, Satellite/Cable box, or Game system to the Yamaha digital sound projector directly; and then connect the YSP-2700's ARC-enabled HDMI output to your TV's ARC-enabled HDMI input. This setup will give you with the best overall sound performance. Matrix Decoders: The Yamaha digital sound projector features Dolby Pro Logic II / Dolby Pro Logic IIx (Movie/Music/Game), and DTS Neo: 6 (Music/Cinema) to enhance two-channel audio formats. The YSP-2700 offers additional Dolby Pro Logic II/IIx parameter adjustments. 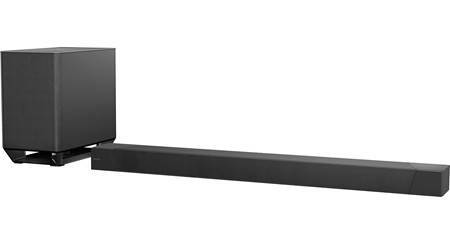 Panorama: Sends stereo signals to the surround speakers as well as the front speakers for a wraparound effect. Dimension: Adjusts the soundfield either towards the front or towards the rear of the room. Center Width: Moves the center channel output completely towards the center speaker or towards the front left and right speakers. CINEMA DSP: Yamaha's CINEMA DSP Digital programs are based on actual soundfield data, measured in famous concert halls, jazz clubs, live performance venues and theaters. 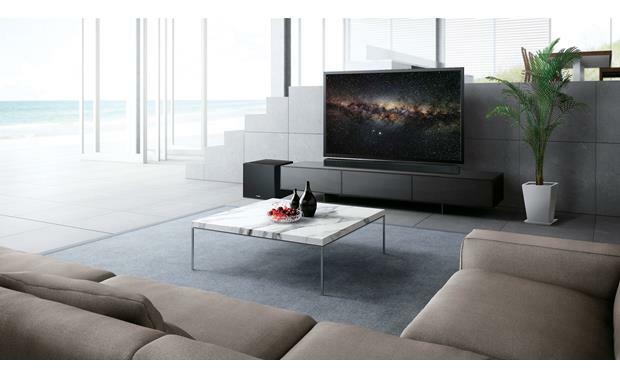 The result is an amazingly spacious and realistic soundfield experience for enjoying music and viewing movies in your living room. The YSP-2700 features 10 different surround programs for movies, music, and other entertainment. Audio Enhancements: The YSP-2700 digital sound projector offers a variety of audio settings to enhance your listening experience, no matter your audio source. Compressed Music Enhancer: The Compressed Music Enhancer restores frequency response lost during digital compression, so your music sounds the way it should. It is optimized for any compressed content, for vivid, lively sound quality during wireless playback. The function can be switched on and off via the remote control, according to the input source. Tone Control: You can adjust the YSP-2700's Bass & Treble to increase or decrease the system's high/low frequency sound. Volume Control Settings: The Yamaha YSP-2700 Digital Sound Projector System offers unique volume control settings. Adaptive DRC (Dynamic Range Control): Adaptive DRC (Dynamic Range Control) adjusts the dynamic range in relation to the volume; useful at low volume. The amount of dynamic range compression applied to bitstream signals is adjustable; Min/Auto is suitable for low volume listening, Standard is typical for home use, and Max doesn't compress the dynamic range at all. Channel Level: Adjusts the volume (+/-20) of playback for each channel so that sounds are evenly distributed in their respective directions. Volume Trim: The level (+/-12) of each input can be adjusted so the volume remains the same when switching from one input to another. Turn On Volume: The system's volume can be set to come on at a preset level (1-99) when power is turned on. ARC (Audio Return Channel): This feature allows audio to be sent from your compatible TV to the digital sound projector through the same HDMI cable already being used to send audio and video to your TV. This eliminates the need for extra cables connected to your television. HDMI 2.0: The Yamaha YSP-2700 is fitted with three HDMI inputs and one ARC-enabled HDMI output. The HDMI jacks support the latest HDMI 2.0 standards. 4K/60Hz Pass-Through: The YSP-2700 supports up to 4K (3840x2160 pixels) video @ 60 frames per second on all of its HDMI inputs and output. It will also pass a 480i, 480p, 720p, 1080i, or 1080p video signal. HDCP 2.2 Compatible: All of the digital sound projector's HDMI inputs and output support HDCP 2.2, which fully complies with the latest copyright protection standard for 4K video transmission. 4:4:4 Color Subsampling: The YSP-2700's HDMI jacks also support RGB, YCbCr 4:4:4, YCbCr 4:2:2, and YCbCr 4:2:0 color subsampling (@ 60Hz or 50Hz). With 4:4:4 color subsampling, luminance (brightness) and chroma (color) are sampled at the same rate; resulting in an RGB color palette as big as the video sampling rate for a video image with more colors, plus greater color accuracy and detail. HDR (High Dynamic Range) Video): HDR (High Dynamic Range) video provides enhanced picture quality by simultaneously enabling greater detail for both the dark and bright parts of an image. HDR reproduces a greater dynamic range of luminosity or brightness levels, creating greater contrast. This increased contrast reveals the subtle nuances of the image, from detailed blacks and shadows to the brightest whites and colors, plus greater depth. x.v.Color: The Yamaha YSP-2700 digital sound projector supports x.v.Color, offering a wider color range than the current broadcast standard. For the x.v.Color feature to be useful, the entire video production chain must be compatible (camera-editing-format-player-display). Deep Color: The YSP-2700 also supports Deep Color which allows the color depth of video signals passing through HDMI to be raised. The number of colors that could be expressed by 1 pixel was 24 bits (16,777,216 colors) with a standard HDMI jack. However, the number of colors which can be expressed by 1 pixel is 36 bits with a Deep Color enabled HDMI jack. Since the gradation of the depth of a color can be expressed more finely with more bits, continuous color changes can be more smoothly expressed. 3D Ready: The Yamaha digital sound projector's HDMI connectivity supports 3D video pass-through (720p/1080p only) from connected 3D-compatible Blu-ray, games and broadcast devices to 3D-compatible HDTVs (all 3D components must be connected via HDMI). Special eyewear will be required for viewing 3D content. Auto Lip-Sync: The digital sound projector automatically adjusts the delay in output timing between video signals and audio signals so they match when you are watching a movie. You can also manually adjust the audio delay between 0 to 500 ms.
MusicCast: The Yamaha YSP-2700 is part of Yamaha's MusicCast multiroom audio eco-system. MusicCast from Yamaha, brings music to every room in your home wirelessly with control provided by a free app on your Apple iOS or Android device. Designed to easily work with your existing home WiFi network, MusicCast offers access to a huge range of audio content. This content includes select online music services, Internet radio, digital music libraries, and Bluetooth audio; as well as connected external sources such as TVs, cable/satellite boxes, Blu-ray/DVD Disc players, and CD/SACD players. MusicCast can even select terrestrial AM/FM radio stations for playback throughout the home when linked to a tuner-enabled MusicCast device (like an AV receiver). MusicCast is enabled on many 2015-up Yamaha components like this digital sound projector, plus their AV receivers, wireless speakers, and other HiFi components. Multiroom Audio: Start with the Yamaha YSP-2700 system in your living room or bedroom and add other MusicCast products from Yamaha (like wireless speakers, AV receiver, and HiFi systems ) over time to create a multiroom audio, whole-house experience. Up to 10 MusicCast devices can be connected. Wired or Wireless Network Connection: The Yamaha MusicCast YSP-2700 supports both WiFi (802.11 b/g/n; 2.4GHz) and wired Ethernet (RJ-45) connections, so you can choose to build a wireless or wired network, or a combination of both if desired. Network setup is completed through the free MusicCast app on your compatible Apple iOS or Android device. Source Selection: From the app you can select which source or sources you want to listen to; choose from network-connected devices, select online music services, Internet Radio or Bluetooth for the YSP-2700. 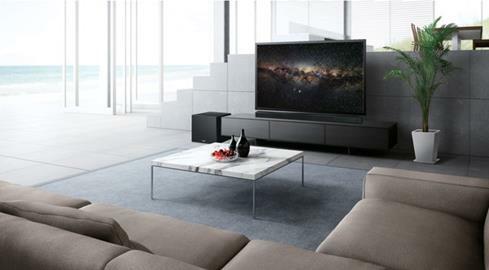 You can also select from the digital sound projector's HDMI, digital and analog inputs, plus TV audio. High Resolution Audio: The Yamaha YSP-2700 supports true high-resolution audio formats to deliver more accurate reproduction of sonic details. The digital sound projector system is compatible with Apple Lossless (ALAC) up to 96kHz/24-bit, as well as FLAC and WAV music files up to 192kHz/24-bit. It also supports lower resolution music files like MP3, WMA, and AAC up to 48kHz. AirPlay: AirPlay lets you stream your favorite songs directly from your Apple iOS (4.3.3+) device or from your iTunes (10.2.2+) library on your Windows PC or Mac computer to the Yamaha MusicCast YSP-2700 system, over your home's WiFi network connection. From your Apple iOS device you are able to stream stored music and music apps on your device to the Yamaha MusicCast speaker. From your Windows or Mac you can stream your stored iTunes music library on your computer to the MusicCast speaker. DLNA: The MusicCast YSP-2700 system supports DLNA (Digital Living Network Alliance) 1.5, allowing access to DLNA-compatible Windows 7/8 computers (with Windows Media Player 11 or 12) and network attached storage (NAS) devices. You'll be able to wirelessly stream the music libraries on your computer, laptop, or NAS to the Yamaha MusicCast speaker system. Bluetooth Audio: The Yamaha MusicCast YSP-2700 offers built-in Bluetooth (v.2.1+EDR) for wireless music streaming & control. This allows you to stream stored music and music apps on your Bluetooth-enabled Apple iPod/iPhone/iPad, Android smartphone/tablet, Windows Phone/PC, Mac computer/laptop, and more to the digital sound projector. In addition to support for the standard SBC Bluetooth audio codec, the YSP-2700 offers support of AAC. By supporting AAC, the digital sound projector offers better audio performance of the music streamed from your Apple iPod, iPhone, or iPad. Note: The speaker can be paired with up to 20 devices, but only one can be actively connected. Home Theater Controller App (for iOS & Android): The YSP-2700 is compatible with Yamaha's Home Theater Control App (HT Controller), available for free download from the Apple's App Store or Google Play Store for Apple iPod touch/iPhone/iPad (iOS 8.0+) or Android smartphone/tablet (OS 2.3.3+). This remote app makes it easy to control the digital sound projector from your compatible Apple iOS or Android device via a WiFi network connection. Its intuitive and easy-to-see operating screen uses icons that let you easily perform a variety of operations. Basic functions include Input Selection and Volume Up/Down. Advanced functions include selecting Listening Modes, Cinema DSP modes, or adjusting Sound Beams for the best listening experience. 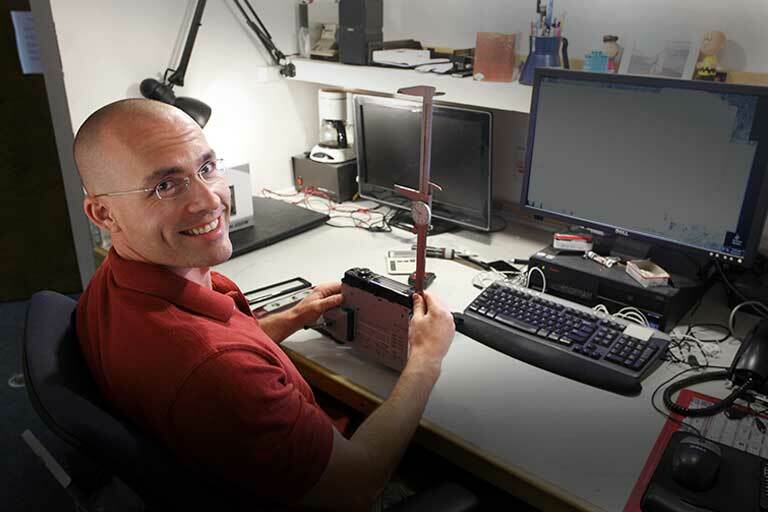 IR Remote: The YSP-2700 comes with an IR remote control for wireless operation of the system. The remote is not programmable and your TV's remote cannot be programmed to control the YSP-2700. However, the system does offer HDMI control (see below). HDMI Control: You can also use your TV's remote control to operate this system, if your television supports the HDMI control function and is connected to the digital sound projector's HDMI output. The digital sound projector will automatically select the input according to the input source setting on your TV. You will also be able to turn on/off the digital sound projector with your television. OSD (On-Screen Display): A convenient on-screen display provides menu setup and audio adjustments. On-screen menu text can set to English, German, French, Spanish, Italian, Dutch, Russian, Swedish, Turkish, or Japanese. Note: You will need an Alexa-enabled device (Amazon Echo, Echo Dot, Tap, or Echo Show - all sold separately) to operate certain functions of your MusicCast products via voice-command. The MusicCast components and the Alex-enabled devices must be on the same network. Auto Standby & Sleep Timer: The digital sound projector will automatically enter standby mode after approximately 20 minutes of no audio playback and no operation. You can set the unit's Sleep Timer to 30, 60, 90 or 120 minutes from the app on your compatible mobile device. Firmware Updates: New firmware updates that provide additional features or product improvements will be released by Yamaha in the future. If the digital sound projector is connected to the Internet, you can download the firmware via the network and update it. If the digital sound projector is not connected to the Internet, you can download the latest firmware update from the Yamaha Website to a USB thumbdrive, which can then be used to update the speaker's firmware. Tabletop or Wall-Mount Digital Sound Projector: At only 2" tall, the digital sound projector fits perfectly in front of a TV without blocking the picture. Feet are supplied to increase the height of the speaker in order to straddle some TV stands. It can also wall-mounted using an optional accessory bracket (022SPMK20, sold separately). The digital sound projector can be positioned parallel to a wall or in a corner. The only major requirement is the room must have side and rear walls for beam reflection to create the surround effect. Flexible Placement for Wireless Sub: The wireless powered subwoofer eliminates the need to connect cables, so setup and placement are faster and easier. You will still need to connect the powered sub's power cord to an AC outlet. 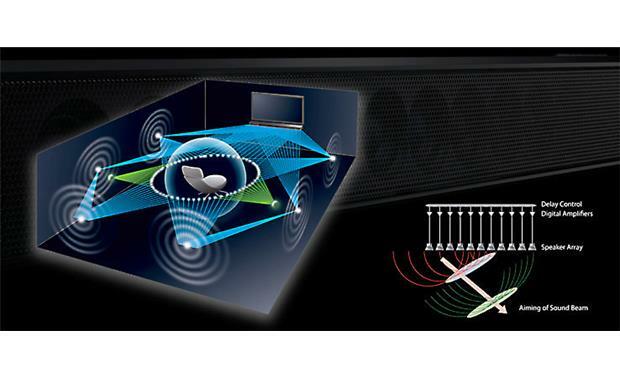 The wireless sub can be positioned almost anywhere in the room (up to 50'). For best performance, it should be placed on the same wall as the digital sound projector. The strain relief on the power cord itself doesn't stand off past the back edge of the unit. I've used the wall mount for it and the mount itself pushes the soundbar off the wall just under 1". The main thing you have to worry about is an HDMI cable you might have plugged into it since some of those tend to be tall. The power cord enters at just over 3 inches from the left side and centered vertically. I seems to be hardwired, with no strain relief, so it can be folded over and not add any more depth than the thickness of the cord. There's a small antenna on the center, top, back of the speaker which projects a minimum of about 7/16" when folded over. That antenna will certainly stick out farther than the power cord. Can it be mounted to a universal soundbarbracket or you have to use Yamaha bracket? Mounting holes for the YSP-2700 are on the bottom of the unit. Universal brackets typically mount on the back so you still may need the Yamaha bracket depending on the universal bracket you chose. You are going to need the Yamaha bracket as well, the mounting holes are on the bottom of the unit, not the back. Will this fit on tabletop under my LG OLED 65 inch C8 (mounted on stand that came with TV)? Yes, I'm doing exactly that with an LG OLED remote. As long as long HDMI control of devices it will work fine. I love my YSP-2700. Have had it since November 2016. Yes the TV remote and the cable remote. Yes. Control my speaker with my basic cable remote using the arc connection. I think it will because I use my Directv remote to control the volume on my unit. I have this hooked up with Apple TV and I control volume through the Apple TV remote. 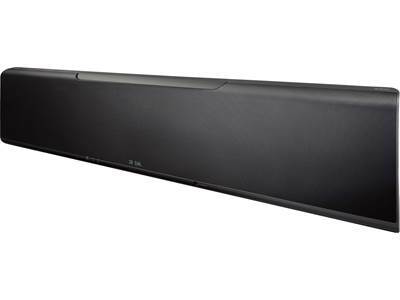 Does this sound bar have an auto on feature? Or even a feature where it's always on? With the remote I prefer, I do not have the option to program a power function for an audio device (only volume up/down and mute) and I do not want to have to physically turn it on each time. does this system require rear speakers for surround sound? No, it's a simulated surround sound achieved by bouncing sound off the side and rear walls of your room. No - but you would swear that there were speakers behind you! does the HDMI inputs on the YSP-2700 support 4K-ready HDR? I know the YSP-5600 does not do the older hardware, that the HDR standard was not established yet when they produced the YSP-5600. Even though the YSP-2700 is a step down, it may support HDR, could you please clarify this ? I think i saw from a post in Sept 2016 that the 2700 can pass 4k HDR video. Yes it does. Look at page 89 and 90 of the owners manuall. You might have to switch which mode it is in. yes, it does support HDR. I have Warcraft and X-Men Apocalypse in4K HDR and it plays fantastic!! 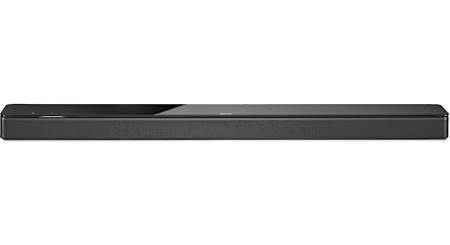 Searches related to the Yamaha YSP-2700 Digital Sound Projector Powered sound bar with MusicCast and 4K/HDR video passthrough.